Professor Banning is a Consultant Interventional Cardiologist in Oxford. He has an interest in the development of drug-eluting stents and participated in many landmark interventional studies (e.g. Taxus, Syntax, Noble and Excel). He has a particular interest in interventions for left main coronary artery diesase and revascularisation injury. 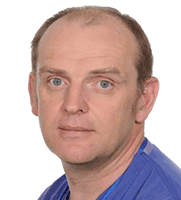 He has >300 PubMed citations and is the current President of the British Cardiovascular Intervention Society (BCIS).